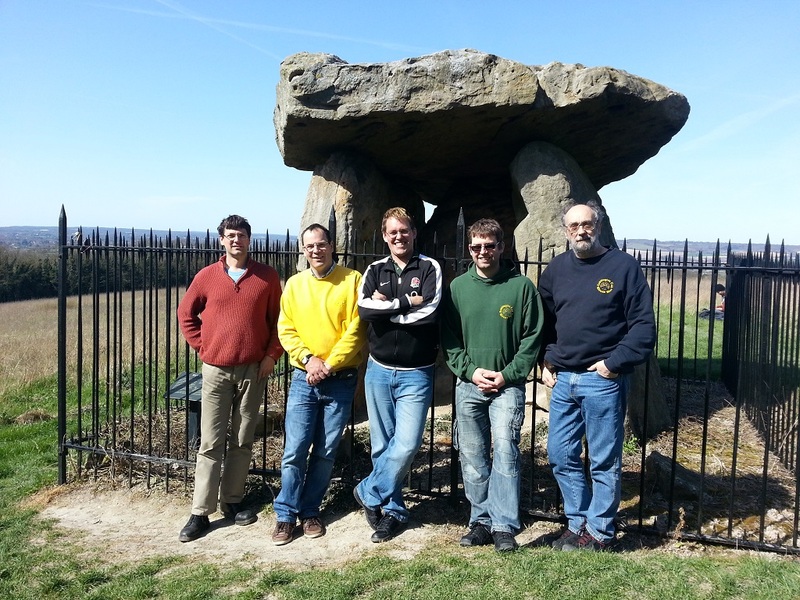 This blog is brought to you by the letters T&B (Tom Brown thanks you so much) Also, thanks to Roz for the pics. As things sometimes don’t work out as planned, I was unable to make it down to this years tour of Kent with Kits Coty Morris due to being really, really sick 😦 Gutted is not even close to how I felt making the call Thursday to let the lads know I was not going. However, 7 made it down. You may have noticed Bill dancing in his rag jacket – no we have not changed our kit policy, someone (who shall remain nameless GB) forgot their waistcoat and shirt! We were a man down as we set off for Kent on Friday morning but hopes were high for a great weekend. In keeping with tradition someone always forgets something but white shirt and leather waist coat are pretty vital. The Court will sit. Weekend kicked off with a session at the Dog and Gun. Great playing from Kits Coty’s musicians and rather too much ale consumed by myself, I never did get my coffee and two sugars just another pint but I didn’t really expect anything less. 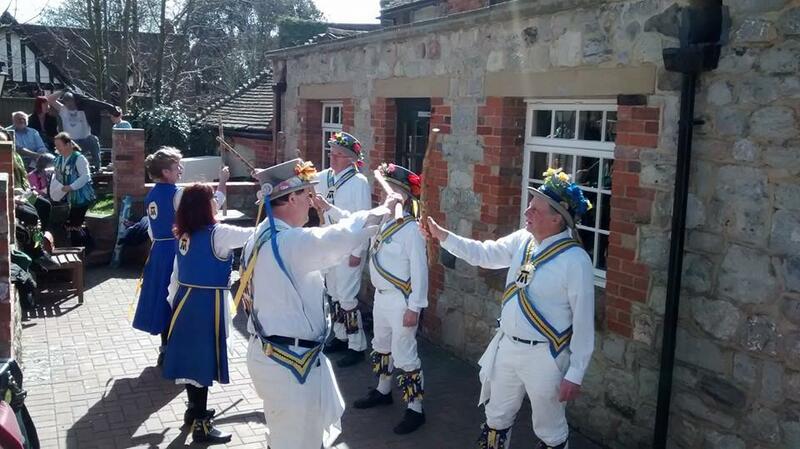 Saturday started at the Society Rooms with dancing in the rain at 10:00am then down to the Canon (still not a pub!) for dancing in Maidstone town centre. The rain abated while we waited, with NO ALE, for the bus that was running late to take us to Sutton Valance for the rest of the tour. Finally the bus arrived unfortunately with a grumpy bus driver so no singing or music on the way. 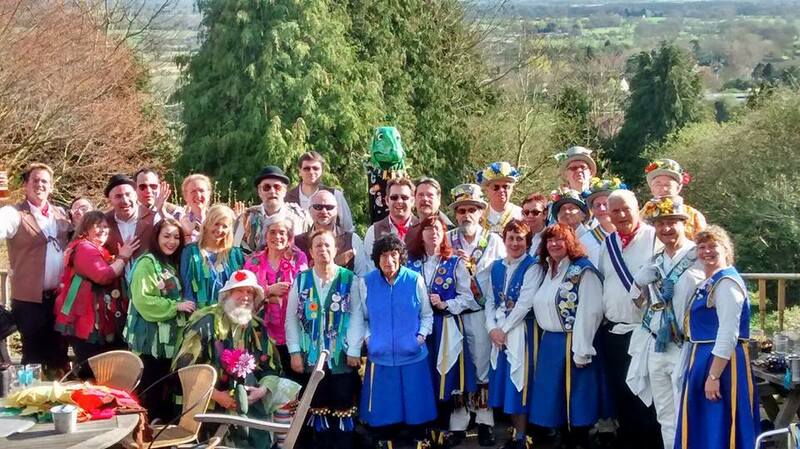 Arrived at Sutton Valance for lunch and dancing at the Kings Head. 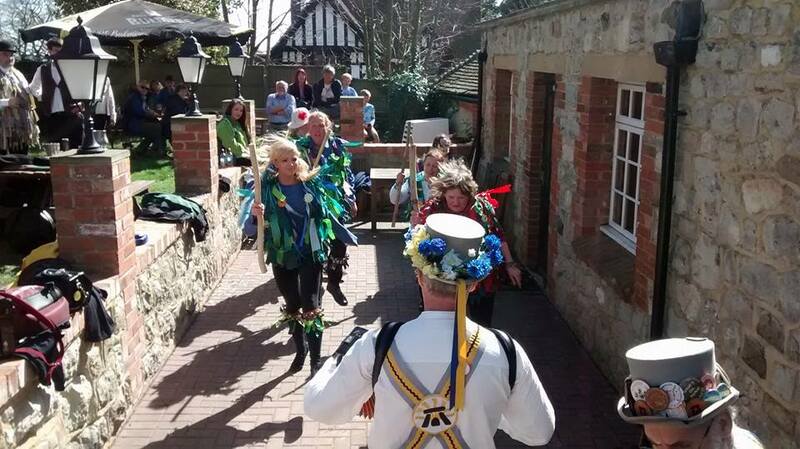 the sun was out by this point so dancing was much more enjoyable. Then we walked down to the Castle (also not a pub!) for the playing of the Alpine horn bizarre but a very impressive instrument glad I wasn’t lugging it around all day. 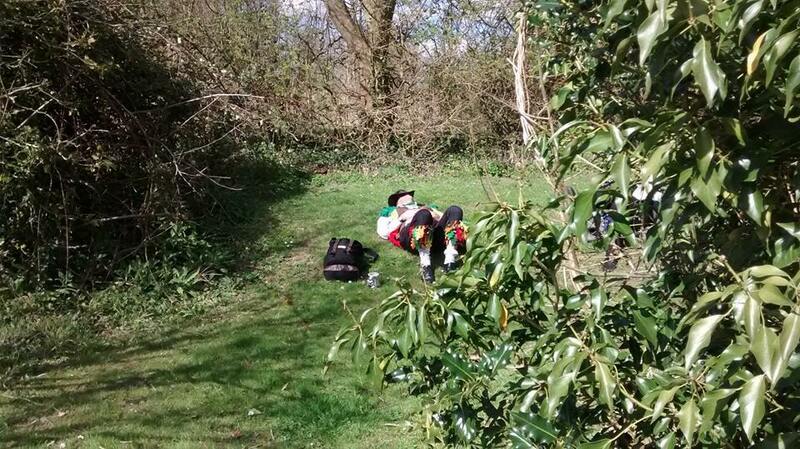 Then more ale and sunshine with dancing at the Clothworkers Arms, Lassington Oak wanted to stay drinking and playing in the sunshine but it wasn’t to be. The bus driver on the way back to Maidstone was in a better mood so singing and music was back on, we arrived back in town for a final dance Bonny Green and then into the pub for some well earned respite. Saturday night the session was held at the White House (a pub!) with great tunes from all and George even got given his punishment (Morrison’s 2% lager) courtesy of the Landlady, but sentence will have to be held off until the Kangaroo court is held! Great so see everyone from Oojahkappivvy brilliant dancing from them and very impressed with the new girl Sian, she dances well and smiles all the way through a dance which is something I can’t master! Thanks to Kits Coty for all their hospitality and for organising such a great event see you all next year for the Lassington Oak Tour of Kent! This entry was posted in Tour and tagged 2015, Kits Coty, Lassington Oak, Ooja Kapivee. Bookmark the permalink.